Thanks Mike. It is good to see this review. However, I am unable to understand the value of the test you report. Isn't it really measuring the efficiency of the power adapters instead of the efficiency of the Winmate board? But it is the board that we have to cool inside the PC case. The combined efficiency of the Winmate+adapter was reported with both adapters. This certainly doesn't test just the adapter efficiency; dc/dc converter and ac/dc adapter work together. As mentioned, I have no easy way to determine the exact efficiency of the dc/dc converter by itself, but I am quite certain it is higher than 88%, at least at mid-load. (65~100W) -- you can extrapolate this from the two sets of load tests. The load demands 100W combined on the 12V, 5V, 3.3V, -12V and 5Vsb lines. To deliver this, (assuming 88% efficiency) the Wingate demands 113.6W at 19VDC from the AC/DC adapter. To deliver 113.6W, the adapter, with an efficiency of 90%, demands 126W from the AC line. The total power lost to heat is 26W; about half of this heat is generated in the DC/DC board, and other half in the AC/DC adapter. The net efficiency is 79.2%. Cooling the DC/DC board is trivial. It generates so little heat. Also lots of other parameters tested and reported -- voltage regulation, operating temp, min load power on, etc. The discussion about this versus other power options for SFF PC builders is surely worthy of interest even without an explicit test verification of the converter's efficiency. I was truly confused about what was measured in the efficiency test. I should have perhaps mentioned this specifically in my last post. Since you are accepting that the Winmate is 88% efficient or better, it appeared as if you were just testing the efficiency of the power adapters. But for what purpose? Now that you made me think it through, here is what I can say. Since the FSP adapter is claimed to be 86% efficient and the Winmate board is claimed to be 88% efficient, the combined claimed efficiency of the two together amounts to 75%. Since the test results show better efficiency than this for most of the operating range, the claim of the Winmate board is essentially verified. That is very clever, Mr. Chin! But you can hardly expect us to figure all this out by ourselves!! Last edited by reddyuday on Mon Oct 26, 2009 11:46 pm, edited 1 time in total. Very nice review, Mike. I can't help beginning by pointing out an amusing typo--"A low power DC/DC converter is usually quiet [sic] small." I guess you've typed "quiet" just too many times. Coincidentally, just yesterday I was building an E3200 system with an old 300W Seasonic. It idles at 47W, but I was wondering what it would do with a more efficient power supply. Now I'll find out, because I picked up a Winmate with the 150W AC adapter. Thanks. Oops! Sorry, I didn't mean no offence! I was truly confused about what was measured in the efficiency test. I reread your post, decided my comment was an overreaction, and changed it when your post came in at the same time. No offence taken. That's a good clarification and I've borrowed it to use in that discussion about efficiency, hope you don't mind! BTW, someone from Winmate just contacted me about the article. Their only real comment: Please change the price to $60. So it's been done -- the official MSRP is $60. However, as everyone here knows, Electrodacus is offering at $30. BTW, someone from Winmate just contacted me about the article. Impressive. SPCR news travels fast! - if many USB devices are connected, for example, pulling on the 5V line â€” there will be less current available for the CPU or GPU, the big current demanders on the 12V line. At least on my computer all USB connectors are powered by the 5Vsb, so that has no impact on the power available on any other line. After some experimentation with the SPCR power supply test system, a way to measure the energy efficiency of the power adapters was established. This methodology has to be refined, but the preliminary results look accurate. The FSP120-AAB adapter was found to have about 86~89% efficiency. This suggests that the Winmate DD-24AX V220-2 has a much higher efficiency than 88%. At the high point of the curve, it appears to be at least 93% efficient, and the 88% figure can be regarded as a worst case. More on all this to come later, as a method of directly measuring the efficiency of the Winmate DC/DC adapter is being devised. On my computer USB ports are supplied from 5V line when computer is ruining and at suspend hibernate and power down USB will use the 5Vsb. I do not think on your computer is different. I think it quite possibly is. Some boards switch, some only use one or the other, some have a jumper to select which to use. It's pot luck which you end up with (unfortunately). Hi, I was thinking if you have a board that doesnâ€™t have USB power on 5vsb it canâ€™t wake with USB mouse/keyboard. Maybe could use a USB back plate adapter routed to motherboard header and then remove the USB power (only) from the motherboard header and the connect directly to the 5vsb on the PSU. Could/would this work, anyone any idea? I think SebRad is wrong I think is a standard that as long as the PC is ON will use the 5V for USB and when power OFF the USB will use the 5Vsb all modern computer can power from USB . Usually even for big ATX power supply you do not have more than 2A available on 5Vsb so you can not use this to supply the USB when computer is running using only two external USB devices and you run out of power if you use the 5Vsb this is used only when computer is powered OFF (or better standby). Is easy to check I did you only have one wire from ATX connector that is 5Vsb and you can connect something like an external HDD and measure the power with the computer on and you will see a very small current about 100 - 200mA the when you power off the computer the current will increase to 900mA in my case with the external HDD and if I remove the external HDD the power will go down to less than 100mA. 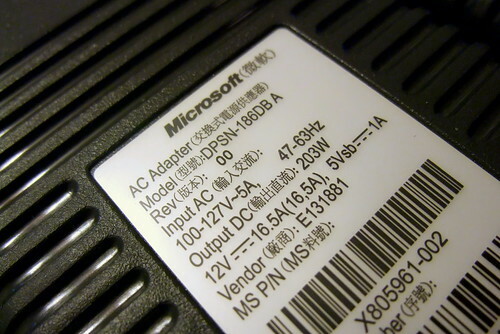 Has anyone tried a power supply for an Xbox 360? They seem to put out 12V DC up to 200 W: Amazon.com Link. The price seems good, but there might be a trick or two to getting it to work just right. I know there's a couple of models of them, due to the various Xbox models Microsoft has released. That looks like a reasonable option, and cheap. The price is OK but it seems this AC adapter is using a fan for cooling so it will not be silent also in this photo of the label the input current is 5A at 100V this will be 500W for a 203W output so is probably not power efficient. I fond this Link someone is trying to use this with a PicoPSU. PS: This Xbox AC adapter will not work with DD-24AX this require min 18V input so it is not making to much sense to post here. Would it not be possible to measure the efficiency of both stages by measuring the DC current and voltage out from the AC/DC adaptor (or into the DC/DC converter)? I'm not sure how accurate multimeters are for current measurements, but it should be possible to find suitable current sense resistors (> 0.1 Ohm) and measure the voltage across them. Ah, drat. I read the article and then commented a few days later. So much for my brilliant idea. I notice that DC/DC modules like this appear to offer very few connections, with this one it looks like there's only a single SATA power cable. That's fine for a minimalist build, but are there any options for someone who'd want to run 3 or 4 drives in their PC? Not really a good idea with a 130W DC/DC module. Startup peaks on 3.5" drives reach >20W. With 3-4 drives, even if it's brief and not exceeding the max power of either adapter or AD module, it's still a lot of wear and tear over time. I'd venture to say, tho, that this DC module will handle 4 modest power desktop drives w/ an energy efficient CPU/board. I overloaded it a bunch of times and it never complained. Am I stupid or can't one get one of these outside Canada, let alone Europe? Ebay page has shipping in Canada only. I got one from electrodacus living in Eastern Europe. Delivery took two weeks. Don't know if I should do it PM but here is a misprint The FSB, in contrast, measured under 40Â°C throughout testing. I sell world wide if you look at the end of eBay listing you will see the shipping for some country. Most of my sales are in Europe the price is almost the same for all European countries Finland is no exception. Shipping to Europe is expensive especially for heavy items see the table below. I purchased the DC-DC converter with a Gateway brick from Electrodacus and just tried it out with a system I'm setting up. The system is pretty basic: MSI G45M Digital, E3200, 4GB RAM, Intel X25-M, SMC PCI-N and a DVD burner. For a PSU, I was using an old Seasonic 300W Super Toronado which is not very efficient by current standards. The system idled at 51W. With the DC-DC converter and Gateway brick, the system idles at 41W. That seems to me to be pretty low for an MATX desktop setup. 41W idle is great for your system (you can not get much less with an Atom board and Atom is 3 to 4x less powerful) I get about 32W idle with a similar system I just use G31 < G45 same amount of RAM undervolted and undercloked Q8400S 32GB-SSD no wireless and DVD is most of the time disconnected. Thanks for sharing the info and recommending the Winmate. I noticed from your ad that you were getting low 30's. I assumed undervolting was producing most of the difference from mine. Do you think G31 draws much less than G45? Have you measured it, or seen it measured? I ask because I have a spare G31 board, and in this system I don't need the graphics advantage of G45. Do you think G31 draws much less than G45? Thanks for linking that thread, which I hadn't seen. Given the small difference at idle between G31 and G45, it seems likely that other differences in motherboards are likely to be more significant.